I came across your website and it's one of the more comprehensive information sites out there. The information base you've assembled is quite impressive, to be honest. IFSA is one of six organizations that either focus entirely on sensors or sensors provide a major thrust for their activities. I read the journal cover to cover- every issue. Thank you for your effort on the behalf of all of us in mems/nano-tech and sensor-transducer technology. I have been reading your magazine. During 16 years that Sensortek, Inc. has been in the sensors business we have recommended your articles to intelligent users. Now that I am consulting and have retired from my business your journal is ever more important. Thanks for your valuable guidance and devotion in sensors industry. Sir, You are the only person on the planet Earth, who initiated, promoted and devoted (and developed the system of publication of sensors in all sense) in case of all types of sensors and providing the information in every corner around the globe. Because of this information, new researchers may get the ideas to fabricate and test the sensors. This may develop any kind of sensors in near future. Sensors portal is the best sensors related resource in the Net. Thank you ! Please take my appreciation of www pages and information. They are clearly and professionally prepared. I do not remember the first visit on your portal but from this time it is still present in my mind. Extremely technical website designed to share information throughout the world in relation to sensors of all kinds. I was absolutely impressed with the level of technical information on this site. I will definitely be visiting this site again. A good site if you are interested in sensors, transducers, MEMS and sensor instrumentation because this site can offer the latest up-to-date educational information at your fingertips. IFSA Newsletter provides consolidated information. It is very useful for us in the design of instruments. A well presented site and easy to navigate. 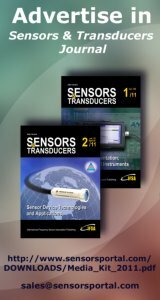 Sensors & Transducers journal has potential to grow as highest impact factor publication. I have checked your website and found it very interesting from professional point of view. I was advised of your sensor site by a colleague and am really impressed by the technical information on it. I have therefore instructed my webmaster to link to it. You have some wonderful information on your website. You have done a nice job. Congratulations. I have found the Sensors Web Portal very interesting (I learned of it in the current issue of Design News, by the way). Excellent layout of information. Well organized. Rich content. One of the best web sites I visit. i got great information from this site..
1999 - 2016 Copyright (C), Sensors Web Portal, Inc. All Rights Reserved.